Starting lights are unhappy creatures. When the light is red, everyone is staring at them and they are proudly shining and shooting spotlight. But then they turn black and they are never ever look at for the rest of the race. And what is worse, they do not even see most interesting situation behind start line – the initial sweep and what is happening in first corner! Luckily, we do not have such bad luck. We can watch the races from comfortable chairs or even some VIP couches. 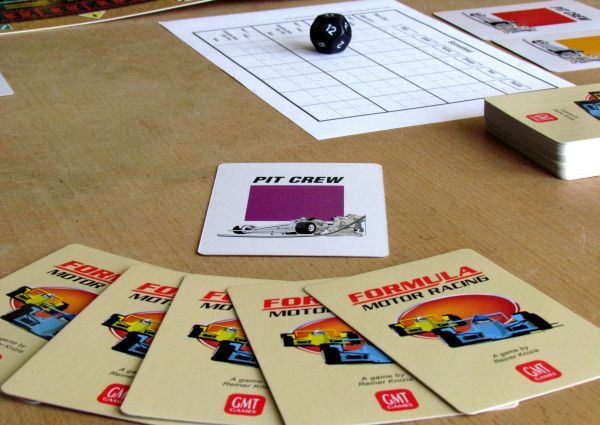 This allows us playing of Formula Motor Racing published by GMT Games and illustrated by Rodger B. MacGowan. This game was invented by Reiner Knizia, before he became obsessed with the same type of children games. This was in 2007, before strange decisions of this once excellent game creator. But Formula Motor Racing is a little different story.. Box welcomes you with a checkered flag, something that many of riders see after the race. Formula 1 is a tricky sport, where just one mistake or treachery of technique and everything is suddenly different, world begins to spin and you are prematurely out of the race. And this tops the checkered flag, through which passes red formula cheered by small glittering papers.. This time is not waiting a far-reaching list of components for us. This is a small box with a simple card game. And it also counts. Specifically, those sixty cards. 54 of them are actions, that will take care of the course of the race, and six represent teams – one for each player. Above them is located a teeny game board. It is oriented in height and you can find twelve starting positions in a column ranging from one to twelve. Around them are various warnings, but also another twelve boxes – a crash lane, this time numbered from twelve to one. On this board folded in half, everything important will take place. Yet in box you get a notebook with lines for three races of championship, before winner is known. Each team has two cars in its colors, exactly as in the true F1. And for the individual runs are also able to note points for riders and teams. Inside the box, in one of the three compartments of exemplary solid insert, is hidden black decahedron dice and together with it also twelve Formula One cars! 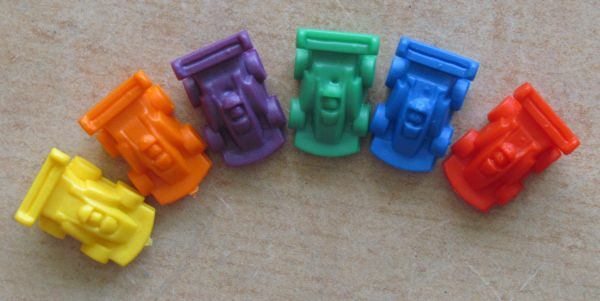 Tiny toy cars act cute, but are distinctive compared with Formula D. They are such a plumper and true game would work without them, but they look pretty at first glance and make the game shine. But now we go even further back to the cards. They are wearing, in addition to image of some cars, two colored lines on the sides. You will find usually a description of some maneuver on them (eg overtaking) and numerals with plus or minus. 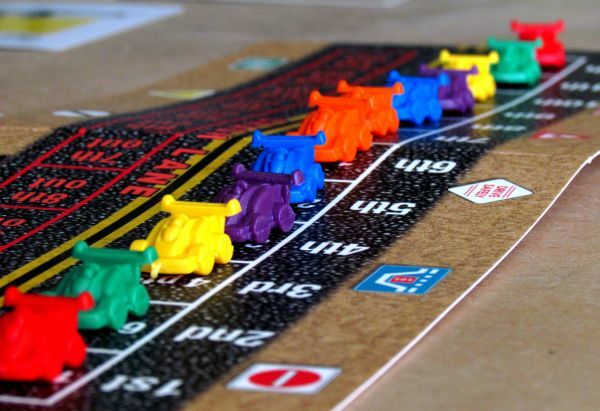 This value indicates change in positions in race, you have reached with this maneuver – a positive number moves you forward through the race field, in case of negative number falls car behind other racers. There are of course other cards, on which can be a number replaced by a question mark or inscription. In this case an accompanying text can be found on cards, explaining the action. 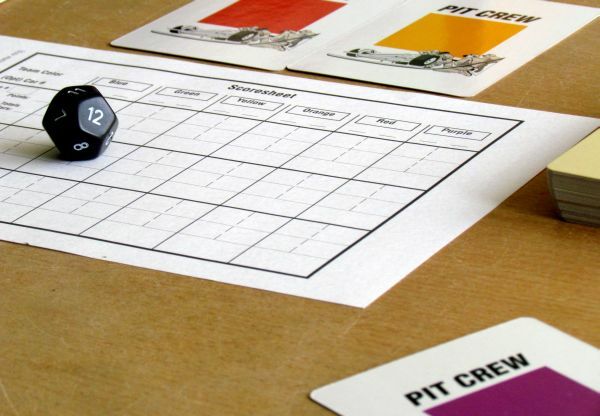 Additional rules usually involve roll of the dice to determine your (or your opponent’s) fate. Well, that’s all. Now we can start preparing ourselves for racing and playing. 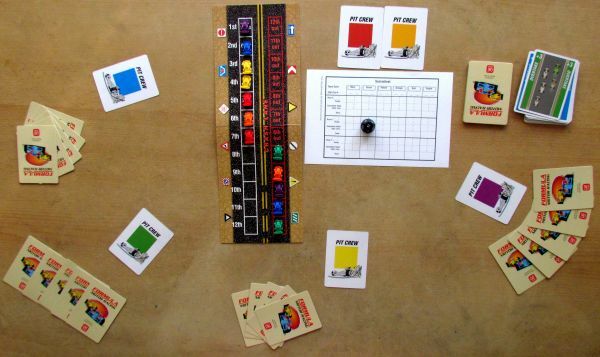 Competitors choose cars and color. If the game runs with three players only, each of them will be playing for two teams. 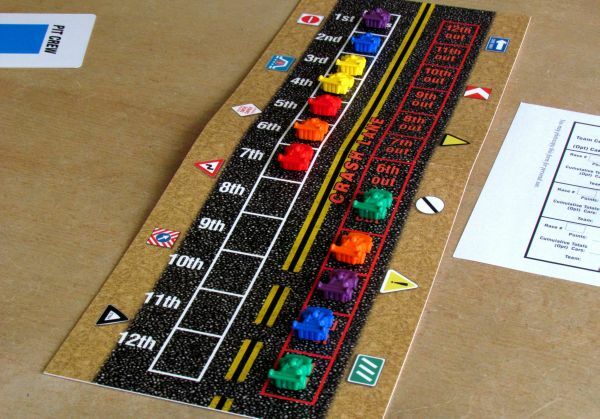 In the four and five-player game participate neutral cars controled by noone. This makes starting blocks always full and race interesting. Now you need to decide on the starting location of vehicles, from which they will drive out to the race – this means positions after qualifying, which is not present in here. Just shuffle team cards and deal them one after another, specifying starting positions. 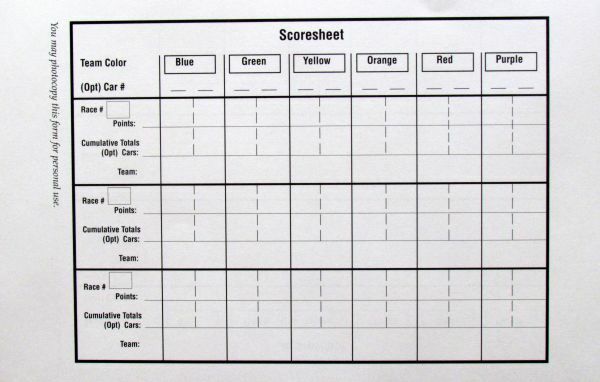 As player colors are revealed, their formula are placed – first color goes to the first and twelfth place, next to the second and eleventh and so on. It is clear, that while riders have not similar starting conditions, teams do and that’s what counts. Everybody has thirteen as a sum of their two car positions. Players put cards with colored squares in front of them to make it clear, who owns which team. Each player gets five cards from shuffled deck and he will be choosing among them the most suitable candidate for playing during his turn. 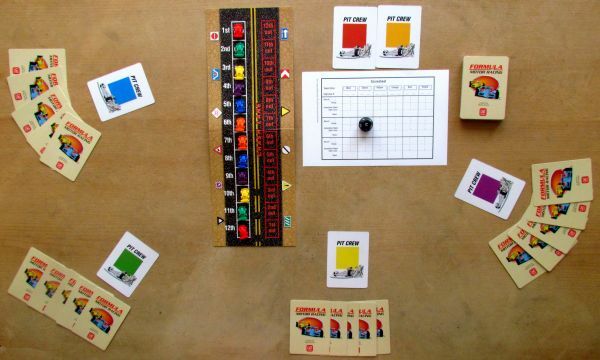 One round always starts with team of the leader car, but the rest of the turn proceeds clockwise around the table. 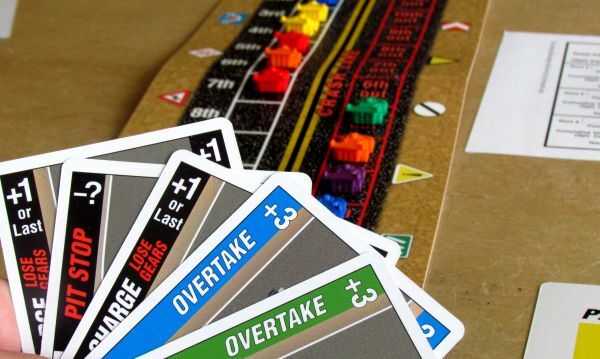 The player can usually choose, which car on the track would their event influence and play that card. Sometimes you have to determine car with random roll of the dice. 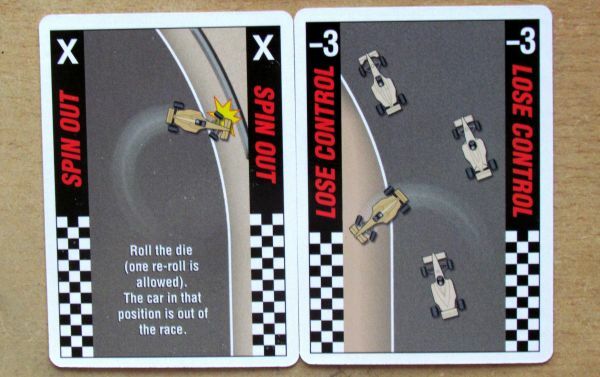 As a result of playing cards, positions on the grid are constantly changing, cars are overtaking here and there, but mainly drop out of the whole race as result of some accident. 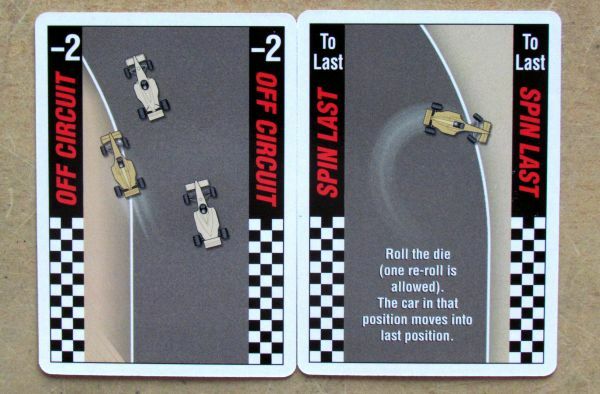 Part of the action cards are offensive, which can disqualify some car from the race. Sometimes you have to play it, even if you do not actually want, because of the selection of cards in your hand. In your turn, you therefore simply play one card from hand and announce the good news. 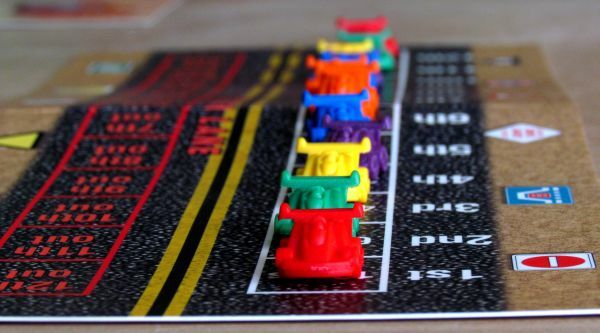 According to the results and selected car, which is influenced by the card, you modify the order of cars on the track and game continues towards another competitor. 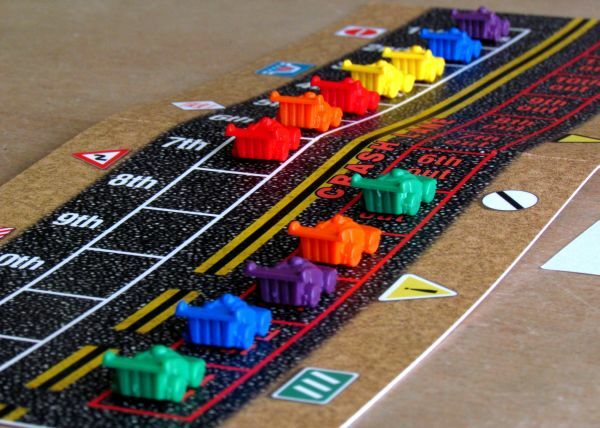 All scrapped cars are placed successively on second track on the game board from the highest numbers up. Because a car dropped out, does not mean, that it can not reach some scoring position. Chasing on the track ends, when you run out of cards in drawing deck. All competitors have one last chance to change the situation and play one last card. Now it’s time to give points for positions, in which formulas crossed the finish line. Points are awarded to first six cars and if so many did not finish the race, you resume with scoring of cars, who have left the race as last. One race lasts approximately ten to twenty minutes and you can simply plan accordingly, how many races will your championship have. Ideal are odd numbers, such as three or five. After each competition, you update experience points in the table and at the end, you add up points for teams.Winner is the player, whose team (teams) accumulated the most points. 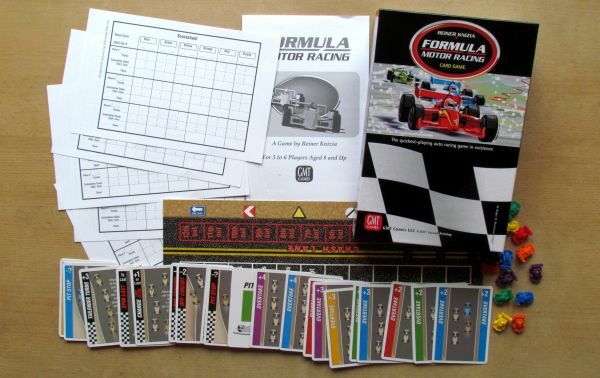 Formula Motor Racing is a racing card game, in which cars are not moved on the track at all. Instead they are constantly overtaking. 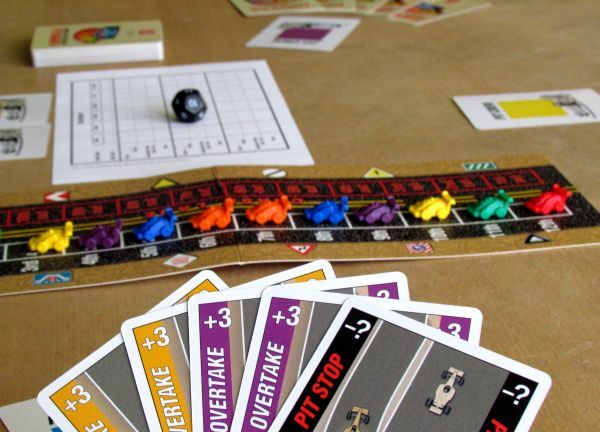 Players have no choice, but to harm their opponents, while moving their cars forward. Cards do not give them a choice, because you want to play only for your benefit and leave others be, you will soon have no interesting cards to choose from. Variability of cards is sufficient, although there is not too much kinds of them in the end. It, moreover, is not ideal, that each race is usually played with all of them. Fortunately, the game is not based on cards tension, but on style the players compete. To this proclamation, there is one closely related recommendations in the rules, which we tested and liked. You remove from one to six cards from the deck for each race. This makes every race a little different in length, selection of cards more tense and the game is a little faster and still exciting. On the contrary, when it comes to planning, knowledge of the deck can greatly help you. If you have oversight, you roughly know, what cards can still be drawn. Apart from the uncertainty, that one of your opponents is holding it in his hands. Without proper timing, you just can not win. Although you can be also simply lucky, that cars around you suffer some unfortunate accidents. Depending on the cards, luck decides for you at some points and that’s a moment, when there is real suspension around the table. Even if you are eliminated from fighting with one racer, you have a second car, you have to worry about. So players are still interested in the game. And even if they lose their second formula, there is still a short game time of one race, thanks to which you are not forced to watch other idle for very long. Thanks to different variants for all player numbers, the grid is constantly full of cars. They are not controlled and just piggybacking. That does not mean, they can not collect points, if you let them reach too far forward! Well, if this would the real Formula 1 look like, we believe, that more people would be watching the race every Sunday. The constant overtaking and uncertainty until last round. You do not know, if you will be able to keep your position or suddenly drop by a few positions back. What is more important though, if you do not succeed in one race and you can still win. And this is the beauty of racing, that designer succeeded to handle very well. 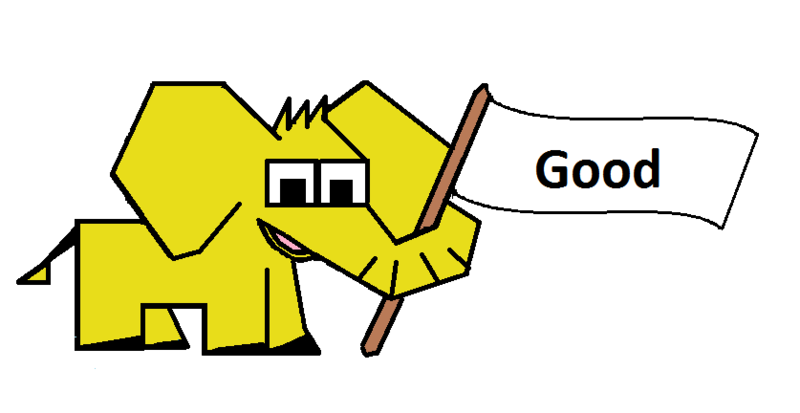 However, the game is simple and can be finished in few moments, just with a little knowledge of English. We recommend Formula Motor Racing for every motorist positive player. 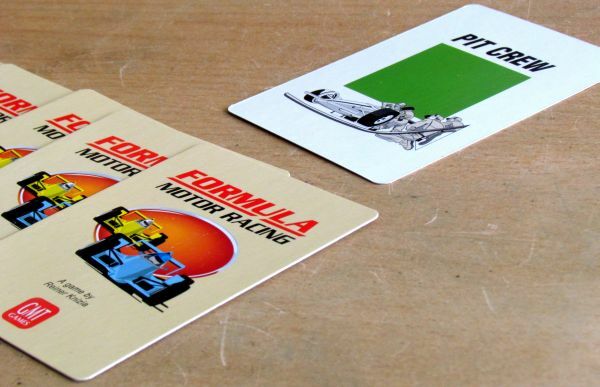 Formula Motor Racing is surprisingly funny and tense racing game, where the main role part of game is played with cards. Racing monopost are here too, but they serve only to mark your position in a race. There is no track needed. It results into a really quick match and also simple rules, depending only on texts on cards. Still you have to invite dice to decide some of your choices with luck, which might result even in a crash of some vehicles. And this luck part of the whole process might bother some players, even when rounds are swift and you can make up for it in next race of championship. And Formula Motor Racing is still nice and pleasant fun, that fits into your pocket, for many motorsport fans, but families too..